Educators (formal and non-formal) who work with youth in grades 6–8 are invited to attend a two-day interactive workshop on soil science and soil-related topics (552k PDF). Rutgers 4-H has extensive experience in Design It! and Explore It! projects and is ready to train and equip your organization to bring this fun, engaging, and inquiry based program to children at your afterschool site(s). By purchasing a comprehensive Design It! or Explore It! package, your afterschool staff will receive all of the training, curriculum guides, materials kits, and support needed to implement year-round STEM programming. Millions of adults and children in the U.S. have at least one developmental disability, according to the United States Census Bureau. To better serve this population, it is important for educators and volunteers to gain an understanding of the characteristics and needs of people living with disabilities. The Developmental Disabilities Training Series consists of five on-line courses will that will provide you with the foundational knowledge needed for teaching, assisting, and working with people with disabilities as well as help you learn how to identify different behavioral patterns and implement effective strategies to manage the educational setting (club, program, classroom, camp, etc). 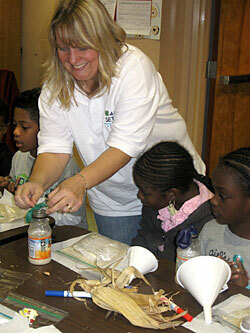 In most counties, 4-H staff members provide a variety of school enrichment programs to public and private schools. While the topics may vary from county to county, they often include science literacy, healthy living, character education, life skill development, and environmental science. These interactive school programs address New Jersey Core Curriculum Standards. Contact your county Rutgers Cooperative Extension office for more details about what is offered in your county. 4-H provides afterschool and summer programming throughout the state. Contact your county Rutgers Cooperative Extension office for more details about what is offered in your county. Join us for our 4-H Rutgerscience Saturday programs focused on introducing middle and high school students to perspective science careers by university faculty and staff on the Rutgers University campuses. Students are provided experiments to take home and are invited to attend follow up sessions on the internet. 4-H has a variety of curriculum resources that engage young people in experiential learning. The New Jersey 4-H Youth Development Program is part of the nationwide Cooperative Extension System. This means we are able to tap into resources developed throughout the country. 4-H has a searchable directory of curriculum products to assist teachers, leaders, and volunteers in finding 4-H curriculum resources. You can search by topic area or keyword, then click on the links to the resources. Visit this directory often as 4-H continues to add new and useful resources to help you with your teaching efforts! Visit the National Directory of 4-H Materials. 4-H staff provide half-day, full-day, and multiple-session special interest programs and trainings on a variety of topics–-for youth, educators, community youth workers, and after-school staff. Check with your county 4-H office for the availability of programs and trainings.